Black and white negative of a photograph of the sons of John MacCarl at the MacCarl-Hopper family reunion at Lynde Creek, Whitby. 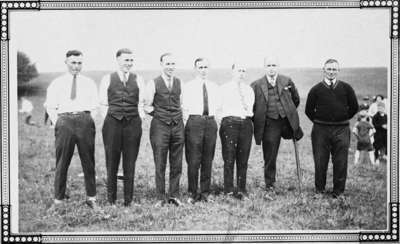 Left to right: William R. MacCarl (1899-1977), Richard MacCarl, Walter MacCarl, Roy MacCarl, Frederick MacCarl, Norman MacCarl (1884-1939), Albert MacCarl (1880-1963). John MacCarl (1852-1933) of Kingston married Tryphena Hopper (1853-1919) in 1877. The couple had ten children: William John (1878-1881), Albert Edgar (1880-1963), Laura Gertrude (1882- ), Norman Russell (1884-1939), Luella (1886-1934), Frederick, Roy, Walter Frank (1895-1984), Richard Henry (1898-1981), and William R. (1899-1977).